Gap Year Travel – A Parent’s Guide 2018 – FREE Resource! 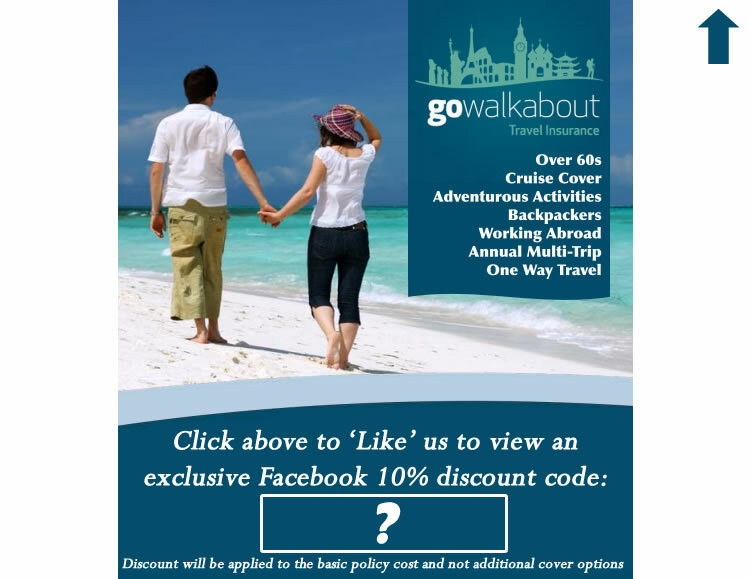 Go Walkabout policies are already very competitively priced for whatever policy meets your travel requirements, but there are also discount codes available, if you’re happy to buy online. One of these, is the Facebook discount code, which will take 10% off the cost of your policy. In order to get this, head to our Facebook page (which is also a very good source of travel news, competitions and Go Walkabout updates by the way! ), ‘like’ the page, and you can then take a look at the discount code by clicking on the ‘special offer discount’ code on the left of the page. If you then enter this code during the online quote process in the box labelled ‘discount code’, it will reduce the quote for the basic policy by 10% . We also have a fantastic limited-time discount which is currently valid if you’re happy to buy your policy online – by 12% ! In order to take advantage of this – please enter the discount code TRIP12 in the ‘discount code’ box when prompted, when you’re entering your travel details to get a quote. **Please note that neither discount code is applicable to any additional payments that you are quoted by either the online or telephone Medical Screening line for any pre-existing medical conditions that you need to declare. If you enter the code, it will just reduce the cost of the basic policy cost, and not anything additional. **Both discounts reduce the cost of the policy, but won’t reduce the cost of any additional policy add-ons (Activity Packs, Work Packs or additional gadget cover). The discounts apply to all policies – single-trip, annual multi-trips and also one-way policies.